I hope you're all having a fantastic weekend, as I'm typing this the weather outside looks amazing so fingers crossed it's still like that when you read this!! This week has been bit of a stinker for me, I've been really busy and not been able to blog as much as I would have liked so I am really enjoying just being able to relax in an empty house and focus my attention. Today's post is not something I've done before but is quite exciting really as it's a bit different and oh so modern of me being an app and all. 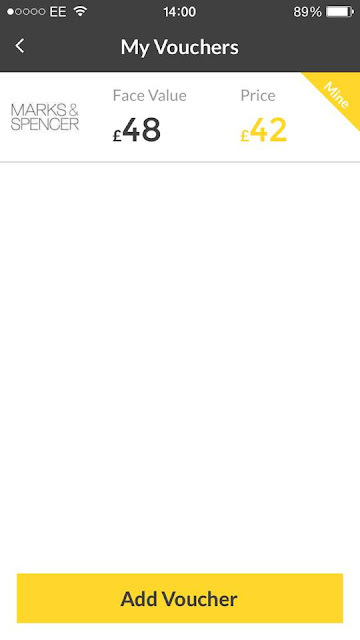 I'm going to be telling you about my experience with a mobile app called Zeek. 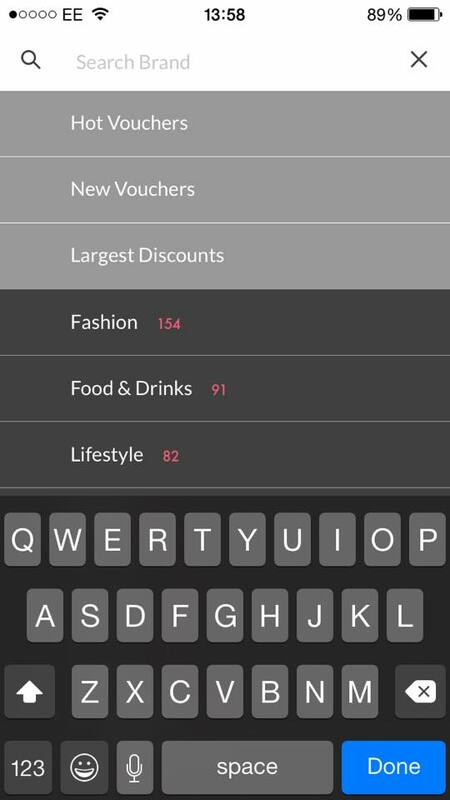 The basic premise of the app is that you can purchase gift vouchers at discounted rates and also you can use it to sell your unwanted gift vouchers if for example you had duplicate gifts on your birthday or Xmas. I'm always up for saving money so figured what's to lose by giving this a try and I was kindly given a credit to start me off, I'll let you know what I picked later on in the post! Firstly, to start buying discounted vouchers all you need to do is download the app by clicking here and then fill in your profile with the basic details required. Once this is done you will then have access to the below screen which will give a list of all the different vouchers available to buy which will automatically default to Hot Vouchers. 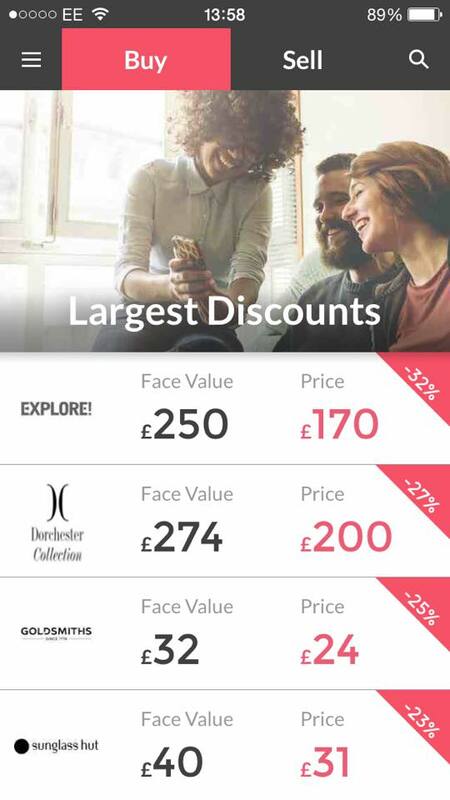 The largest discounts list is my favourite view personally, a lot of these will be for larger voucher amounts as those are often where the highest discounts are found as you can see below but spend some time scrolling through and looking at them all as there are great deals even for smaller amounts to be found. 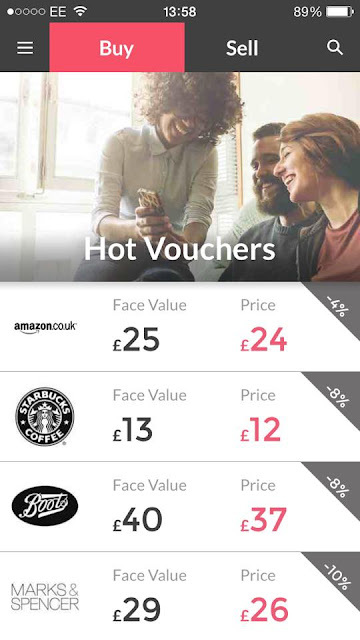 One thing I want to emphasise as well is that as these are vouchers, you can double up on discounts by using codes on the retailers websites as most treat store vouchers the same as they would cash or card payments. So if you are saving on the voucher by say 20% and there is a further deal instore or online, you can really make a fantastic saving! So far the only voucher I have purchased was a £48 M&S voucher* for £42, a saving of £8 and it will go towards my next big shop, but I'm being really picky and trying to assign vouchers to specific things I want to buy. So for example if I know I'm going to Zizzi for dinner I might get the £42 voucher for the price of £34 to pay for the meal and the saving would be equal to almost 2 desserts which is really good in my opinion. Once you purchase a voucher they are stored in the My Vouchers section for easy access as shown below. When you want to redeem it, you will be presented with an e-voucher which was emailed to me as a pdf to print and the serial number and barcode will be displayed on your phone with the expiry date show so you can keep track. There was no delay, it's pretty much instant. It's as simple as that, it's super easy and can save you some money on just everyday shopping. My experience has been great and I wouldn't hesitate to recommend it. If you want to check it out just head on over to this link and get started. I hope you enjoyed this post, let me know if you want to see more money saving ideas in the comments below.